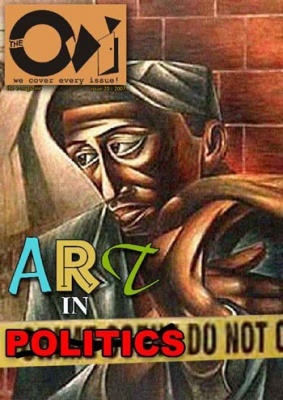 I think a theme like 'art and politics' is one of the most suitable for the thematic Ovi magazine and there are so many angles I’m sure we will not even reach a fraction of them. But, after all, this has never been the role of Ovi magazine. You see, we at Ovi magazine, by exposing our opinions and ideas, want to start a conversation, provoke a conversation that will lead us on to a path of learning. That’s one more thing with us in Ovi magazine and I think all the contributors will agree with me when I say that in Ovi magazine we believe that the only thing we know is that we don’t know anything, as Socrates once said. When we started Ovi magazine we asked ourselves if it was going to be a cultural or a political magazine and after a long conversation we came to the conclusion that the paths of culture and politics meet so often there is no way to separate them. So Ovi magazine is a cultural, artistic, political magazine and with this issue we celebrate its third year online. Three years! It's hard to believe. How we started and where we are now not even close to what we were originally dreaming for the Ovi magazine. We started monthly where half of the magazine was thematic and the other half was filled with contemporary news. That was till we decided that our contemporary news wasn’t contemporary enough and we became daily. To keep both a daily magazine and a monthly thematic has proven a difficult task and that’s why it took nearly a year to publish the next thematic issue. But we first had to make sure that the daily works and that was a very difficult task, especially when all of it is volunteer work. We had to often put aside not only work obligations but family musts. But we did it, we did it and we celebrate our third birthday with a return to our thematic issues that have provoked many conversations in the past and we hope in the future as well. Art and politics. A schizophrenic relationship to use a title of one of my articles, it is like they cannot live together while they cannot live apart either. And we have often mixed art, culture and politics in Ovi magazine. Even the cartoons we host sometimes show this schizophrenic relationship. And I think we did our best to offer you in many ways, including artistic, our opinions. Thank you to all the contributors that stood by our side for these three years, thank you to the friends who contributed to this ‘art and politics’ issue and thank you all of you, the literally thousands of you who read daily Ovi magazine. In the middle there is virtue said the ancient Greeks who loved to hold two views in their mind at the same time and never looked at a coin without turning it to the other side. You have achieved that most rare of balancing acts between politics and art, the old and the new. Not to achieve it is to run the risk of becoming a second rate publication catering to propaganda, ideological fanaticism and "political correctness. You point to freedom of speech as one of your scrupolously held publishing ideals. Indeed, that is the key of your success. Bravo! And keep up the good work. One of the reasons I like to read OVI is that it mixes everything - in the best possible way; you pull it off! You keep it interesting and personal and I know that I will find something interesting every time I check in.